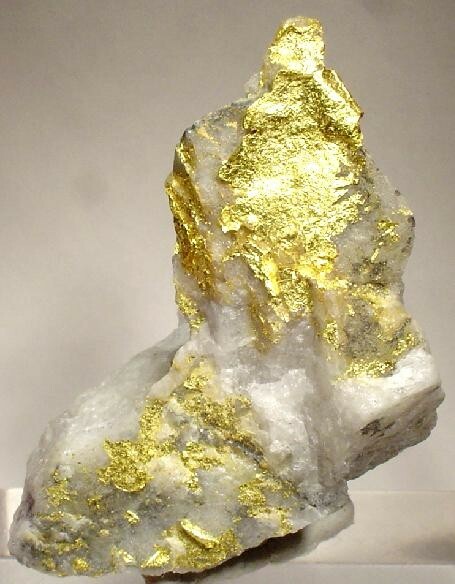 This just in: Over 80% of the world’s commercially viable gold deposits were formed in mountain-building earthquakes. That’s the conclusion of a recent study by Australian geologists Richard Henley and Dion Weatherley. Earthquakes don’t create gold. Rather, they cause gold that is dissolved in water to be precipitated out and deposited in cracks and fissures miles deep in the earth’s crust. When the earth’s tectonic plates suddenly shift along their fault lines (creating an earthquake), small cracks in the rocks can instantaneously become large gaps. Something has to fill those gaps. The rocks aren’t going to. They’re too solid. So the water that flows through the cracks and crannies is rapidly sucked into a much larger space than it would ordinarily fill, causing it to instantly vaporize. In the process of vaporization, it leaves behind any minerals that might have been dissolved in it—such as quartz and gold. As earthquakes repeatedly rocked the earth’s crust over hundreds of thousands of years, gold built up in seams miles below the surface creating concentrations large enough to mine. These earthquakes resulted from the collisions of tectonic plates that caused most of the earth’s great mountain chains to rise skyward. Thus, the gold in your necklace or wedding ring has a violent and traumatic history! What does this have to do with spirituality? Who can look at the ancient mountain ranges peacefully pointing skyward without feeling a sense of wonder and awe? For thousands of years humans have looked up to the mountains and hills and sensed in them a higher, more spiritual way of life. In ancient times, great spiritual leaders climbed mountains to get closer to God. Even today, standing on a mountain peak looking down at the earth arrayed around us can give us some sense of how God must view this world from on high. Yes, from time immemorial mountains have symbolized spirituality, eternity, and companionship with God. The world’s great religions promise deep inner peace, satisfaction, and joy with the attainment of such spirituality. And yet . . . getting there is a whole different story. Never mind the sweat and struggle required to climb a sky-scraping mountain. Consider how the mountains themselves were formed. It’s not a peaceful process. Over the eons, the great plates that form the earth’s continents and sea floors scrape by each other and collide with one another. At the seams where one plate crushes into another, the earth’s crust buckles and crumples violently, forcing the mountain ranges to thrust skyward. Likewise, our spirituality is formed through the elemental collisions and conflicts of life. True spirituality is not formed by retiring from the world. While periods of meditation and contemplation can be useful and spiritually rejuvenating, spirituality that is solid and deep is formed from facing the long, grinding struggles of an active life in the world. As the rough edges of our semi-hardened personality scrape against other people’s rough edges, there is a grinding, buckling, crumpling of our character at its seams that, if it doesn’t destroy us, ultimately causes us to reach upward toward God. As the conflicting drives and desires within our own souls collide with one another, we experience soul-shattering shifts in our mind and heart that also drive us upward toward God for the help, comfort, inspiration, and guidance we need to make it through. And so we arrive at the mountain peaks with a peaceful, inspiring, and joyful spirituality that has been formed from the crash and conflict of life’s earthquakes. During these emotional and interpersonal cataclysms of life, unbeknownst to us there is an amazingly beautiful process going on deep below the troubled surface of our awareness. Deep in the unconscious fissures of our mind, layer after precious layer of quartz and gold are being precipitated out of the flowing lifeblood of our psyche. With each soul-wrenching spiritual conflict or struggle, the crystalline quartz of spiritual understanding, and the soft, warm gold of heavenly love are being deposited layer by layer onto the inner recesses of our soul. With every struggle and conflict comes a deeper understanding of the human situation and of our own true self. Each day that we prevail against the dark forces seeking to drag us down, we gain a greater appreciation for the friends and loved ones who support us, and for God, who sustains us through it all. Each time our soul is violently shifted by the emotional earthquakes that shatter our established habits and patterns of life, the gold of genuine, incorruptible love for God and for our fellow human beings is built up layer by layer deep within us. Spiritual growth can be a violent and painful process. Yet without those seismic shifts of the soul, we could never enjoy the heights and depths of spiritual love symbolized by that gold necklace or wedding band.